The San Diego-based Center for Sustainable Energy has expanded its electric vehicle rebate management to a fourth state with the addition of New York’s Charge NY Drive Clean Rebate initiative. Governor Andrew M. Cuomo officially launched the program last week, providing rebates that will help address the state’s greenhouse gas reduction goals through greater use of zero-emission vehicles. The initiative provides $55 million for rebates up to $2,000 for purchase of a new plug-in hybrid electric car, all-electric car or hydrogen fuel-cell car. 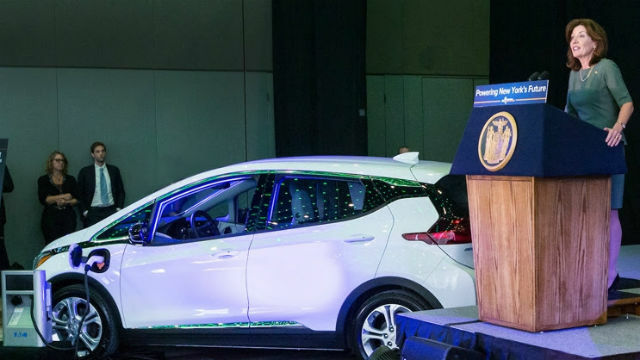 An additional $15 million will support improving consumer awareness of electric vehicles and their benefits, installing more charging stations and other efforts to put more clean vehicles on New York’s roadways. New York already has more than 16,000 electric vehicles on the road. The state is working to install charging infrastructure to accommodate more than 30,000 plug-in electric vehicles by 2018 and 1 million by 2025. CSE also manages statewide electric vehicle incentive programs in California, Massachusetts and Connecticut.